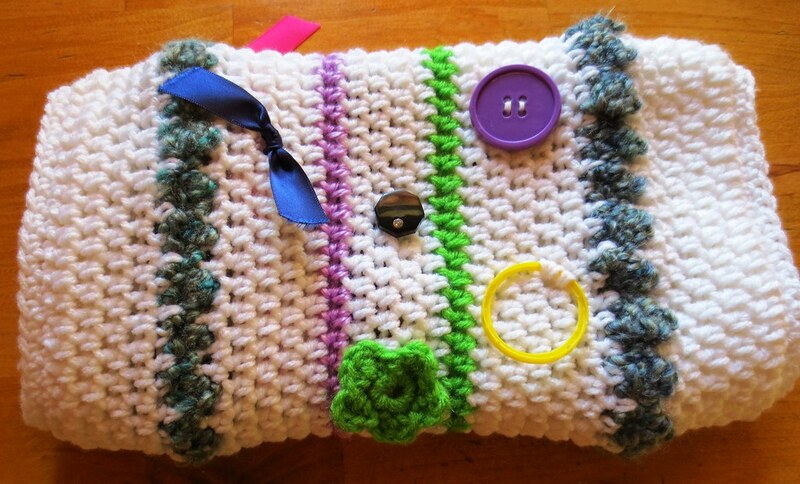 Twiddle muffs are used by people who suffer from Alzheimer’s and dementia. The twiddle muffs provide them with something to hold and manipulate, and something to fidget with thus the name twiddle muff. 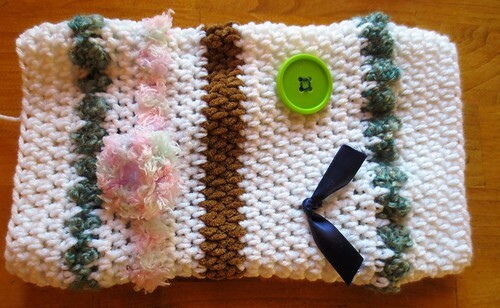 The result of twiddling with the different textures and items on the muff has a calming effect on a person. Plus it doubles as a hand warmer which can provide additional comfort for a person. It is a great project in which to use recycled materials. I set out to use such things as plastic juice rings, plastic bags, old buttons, beads and ribbon along with different textures of yarns. I had this special green plastic bag that was sent to me from an on-line friend. 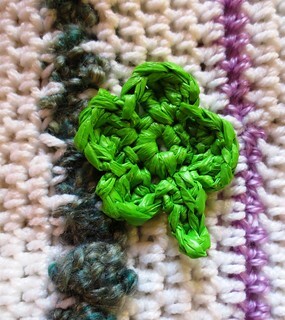 I used the green bag to crochet this 4-leaf plarn clover. I used fun fur to crochet around a recycled milk jug ring that is sewn on the twiddle muff below. 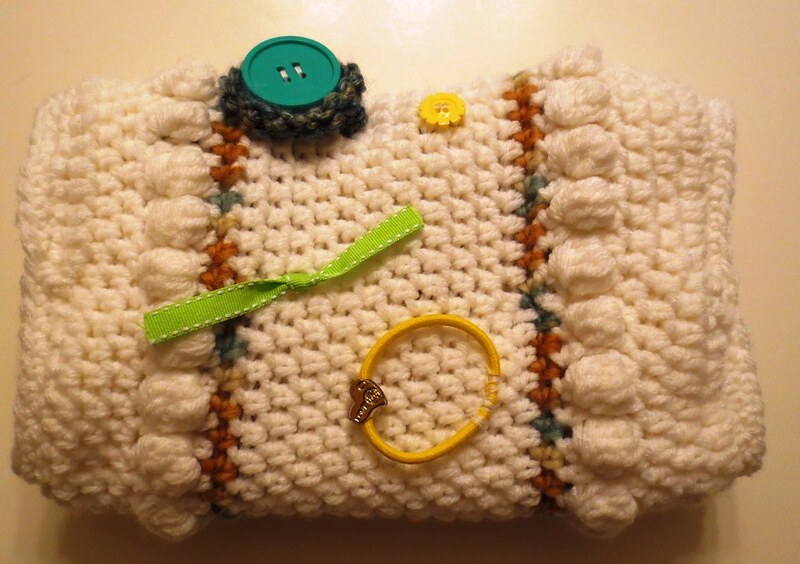 You basically crochet two sleeves and insert one on the inside so the person can twiddle their hands on the inside of the muff. 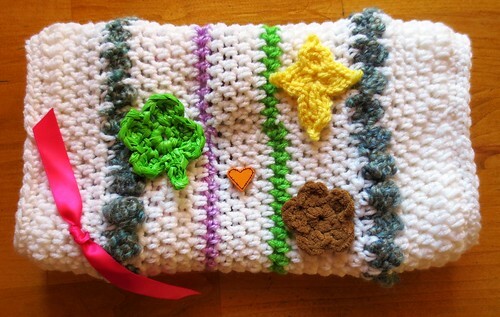 I used this free crochet pattern for my twiddle muffs. 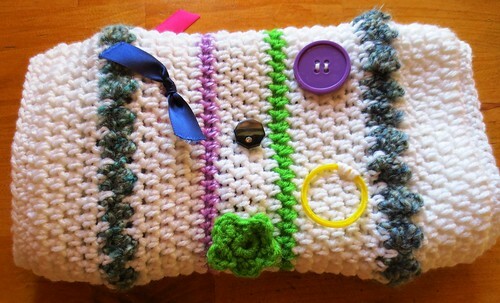 Here is one more photo of another twiddle muff I crocheted. I crocheted several twiddle muffs and donated them to my local nursing home. They say the muffs really are helpful and the stimulation therapy adds to the user’s quality of life. It is very nice. I like the good design. The buttons are on the twiddle muffs, which make it beautiful. Thanks for your sharing. Good job! Thanks for your sharing, and I am very interested in the twiddle muff. I will have a try. © 2017 My Recycled Bags.com - Powered by Wordpress.